The 1970s started with three aircraft being added to the Mount Cook Airlines’ "airline" fleet.. In June a third Douglas DC-3, ZK-BEU was added to the fleet while in September and October 1970 two nine-seater, twin engined, Britten-Norman Islander aircraft, ZK-DBW and ZK-DBV arrived. These versatile aircraft were primarily bought for scenic flying into Milford Sound from both Queenstown and Te Anau but they were also used on scheduled service between Queenstown and Te Anau and the Queenstown-Alexandra-Dunedin service. Many years the Britten Norman Islanders were equipped with skis but these trials proved unsuccessful. From the late 1970s Islanders were also used on scheduled services in the North Island from Auckland to Rotorua and Kerikeri and for a short time to Great Barrier Island. On services from Queenstown the Islanders quickly proved their versatility and they were popular aircraft with pilots and passengers. The service from Queenstown to Alexandra and down to Dunedin, which was operated mainly by the Twin Otter, was running at a loss. Unlike other services from Queenstown the service to Dunedin was dependent more on domestic traffic rather than tourist traffic. 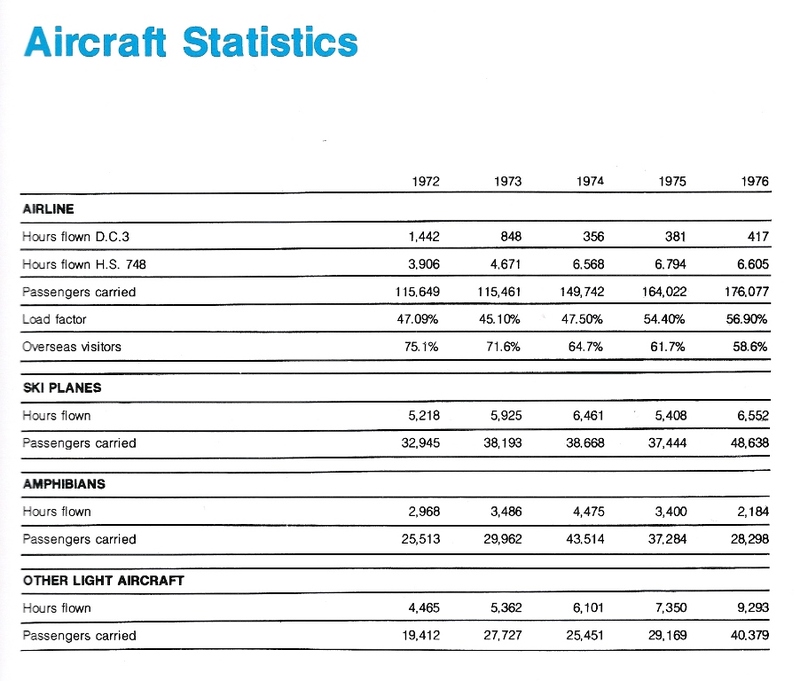 The amount of traffic offering did not warrant the Twin Otter which was withdrawn in September 1973. The Twin Otter was an outstanding aeroplane operationally, but Mount Cook found it very costly to run, and it was replaced with a Britten Norman Islander, which had a lower capital cost. De Havilland Canada Twin Otter ZK-CJZ at Queenstown - "an outstanding aeroplane but very costly to run." 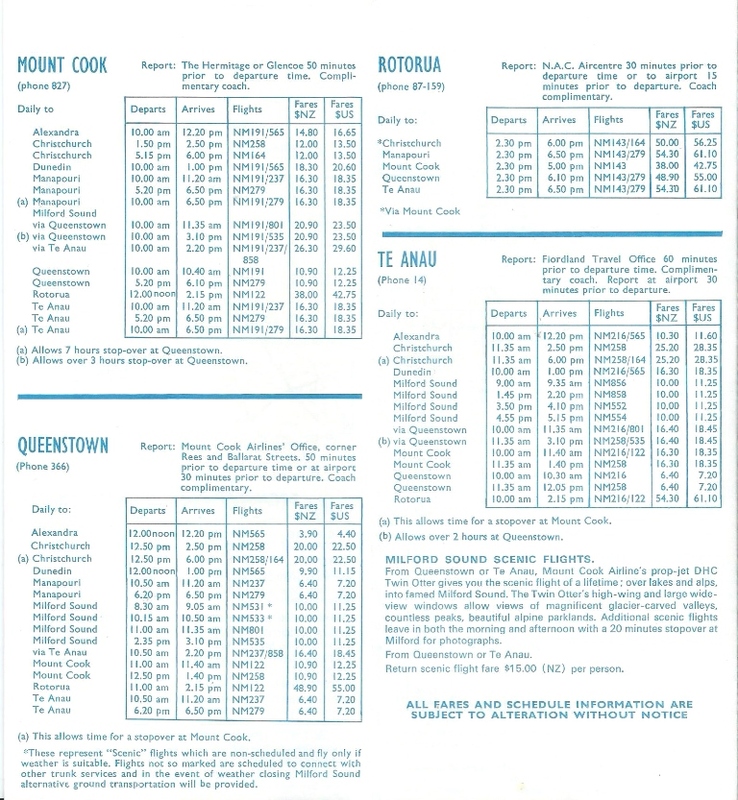 The Mount Cook Airlines' timetable effective 19 October 1970 - The start of the 1970s saw extensive amphibian air services from Auckland to the Hauraki Gulf and Bay of Islands, between Invercargill and Stewart Island and a ski-plane air service from Fox Glacier and Franz Josef to Hokitika. By the end of the 1970s all these services were gone but Mount Cook Airlines had truly become New Zealand's tourist airline. 1970 also saw some changes to the Douglas DC-3 fleet. DC-3 ZK-BEU was registered to Mount Cook and Southern Lakes Tourist Co. Ltd on the 25th of June 1970, while the company’s first DC-3, ZK-BKD, returned to NAC and in July 1970 it was sold to Fieldair who used it for topdressing. Improvements were made to Manapouri airport with the sealing of the runway and in June 1971 the company added its second Hawker Siddeley 748, ZK-DES, to the fleet. This replaced Douglas DC-3 ZK-CAW which went to South Seas Airways Ltd of Auckland. The second 748 enabled the company to operate a Christchurch-Mount Cook-Queenstown-Te Anau/Manapouri and return service while other 748 overnighted at Rotorua offering a morning service to Mount Cook and Queenstown with a late afternoon return service. 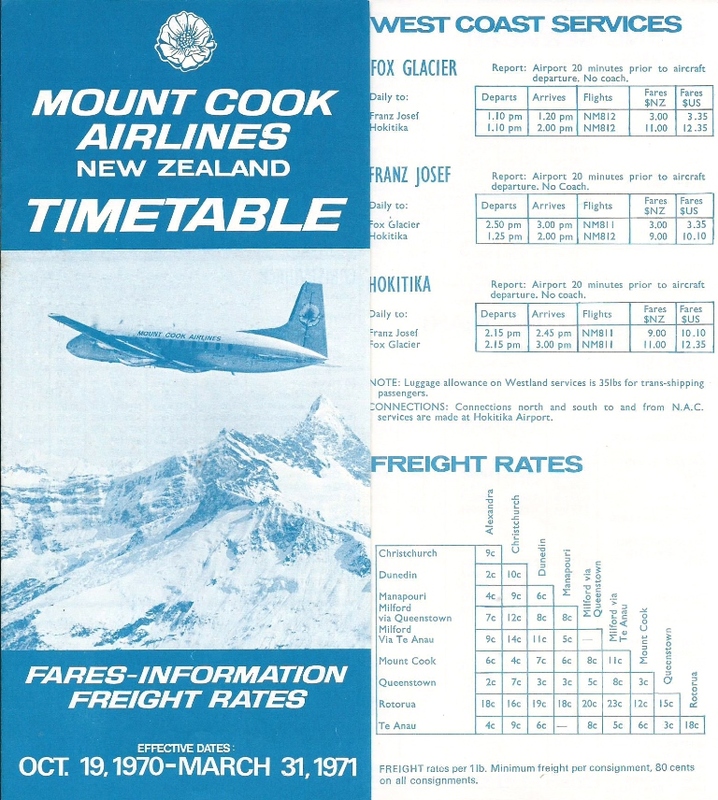 The Mount Cook timetable during these years offered the possibility for passengers flying through Mount Cook a stop of some hours and enabling them time for a ski plane flight before continuing on to the next destination. 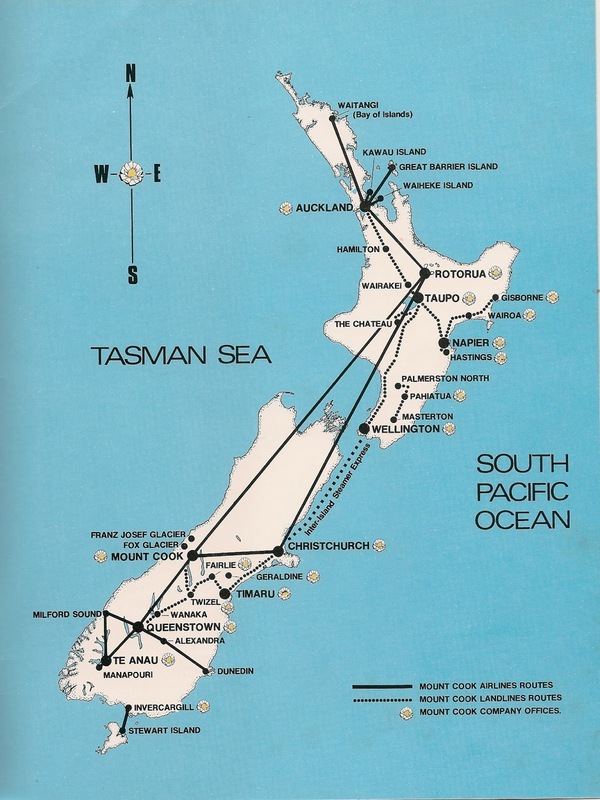 With increasing tourist traffic on its own network and more demand being placed on the Hawker Siddeleys Mount Cook ended its agreement with NAC to operate the daily between Oamaru, Timaru and Christchurch on the 30th of April 1972. The NAC charter had been of real value to the company, giving it a regular income as numbers built on its core tourist routes. Late in 1972 the company imported an 11-seat Grumman Goose, ZK-DFC, to join the Auckland-based amphibian fleet. On the 1st of November 1972 this was used to take over the existing service from Mechanics Bay in downtown Auckland to Paihia in the Bay of Islands. 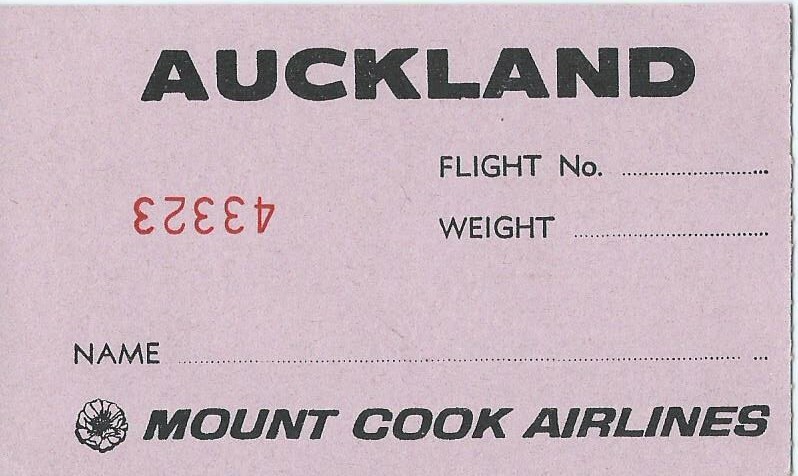 The ‘new’ thrice daily Golden Goose service from Auckland to Paihia was further enhanced on the 28th of November 1972 when Mount Cook Airlines began Hawker Siddeley flights to Auckland as an extension to the Rotorua service. Initially these flights operated on three days a week with southbound flights leaving Auckland on Tuesday, Thursday and Saturday mornings, returning on the evenings of Monday, Wednesday and Friday. The first daily Goose flight from the Bay of Islands left Paihia at 7 a.m. and, if required, the plane landed at Auckland International Airport to connect with the south bound HS748 flight before ending the 55-minute flight at Mechanics Bay. This meant that a tourist could have breakfast at the Waitangi Hotel and then fly to Auckland to connect with the Mount Cook Airlines' Hawker Siddeley 748 flight to Rotorua, Christchurch, Mount Cook Queenstown, Manapouri or Milford Sound. 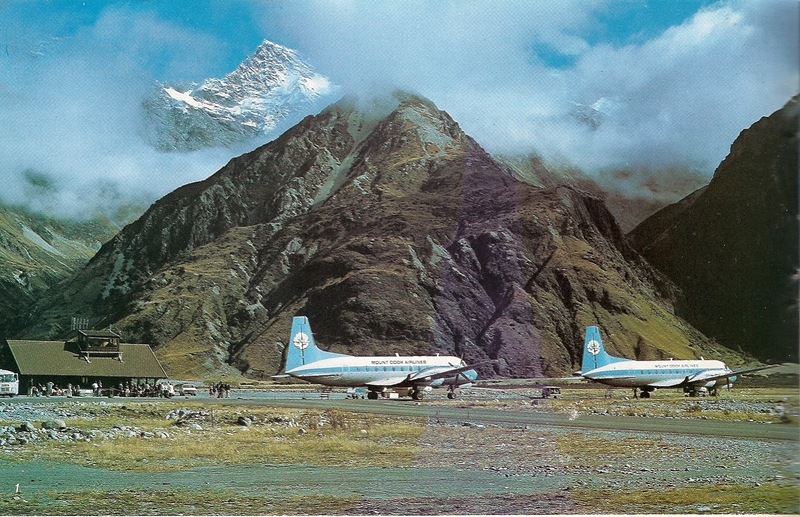 Mount Cook Airlines became the first airlines to connect all the major tourist destinations of New Zealand. While Mount Cook Airlines were happy to get approval to operate into Auckland, there was a catch. While the Licensing Authority recognised the desirability of connections from Auckland to the tourist resorts at Mount Cook and Queenstown, NAC and Air North were already operating on the Auckland-Rotorua sector. Accordingly the Air Services Licensing Authority set conditions that the company could only carry between Auckland and Rotorua those passengers trans-shipping from same day early morning services from Paihia, and that no passengers could be picked up at Rotorua with Auckland as their final destination. In addition, no freight was to be carried between only Auckland and Rotorua and vice versa. The company was also granted an amendment to its licence permitting it to offer non-scheduled passenger and freight services between Mount Cook and Auckland. In November 1972 Douglas DC-3 ZK-AOD was sold to Fieldair leaving only one DC-3, ZK-BEU, in the fleet. 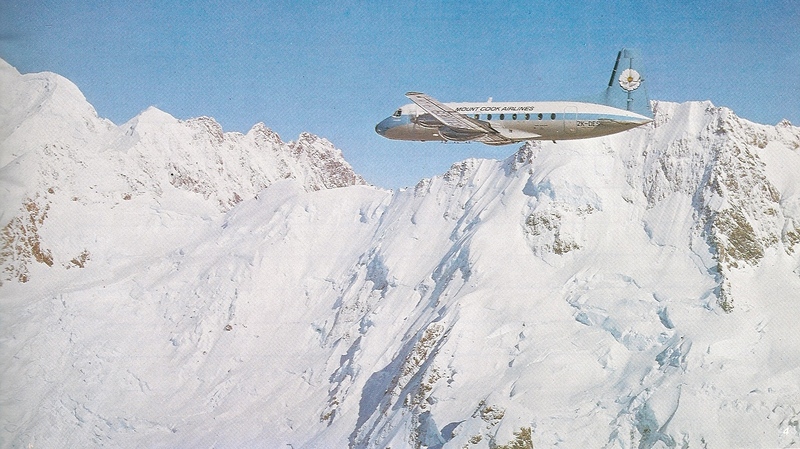 In addition to the 748s being used on Mount Cook’s tourist services they were also often chartered by NAC and this helped the company’s economics. Over the summer of 1972/73 they operated NAC services between Christchurch and Hokitika and Christchurch, Nelson and Wellington. The 748s were also used cover breakdowns for NAC’s Boeing and Friendships. As passenger numbers increased Mount Cook, at times, had to charter Friendship capacity from NAC. 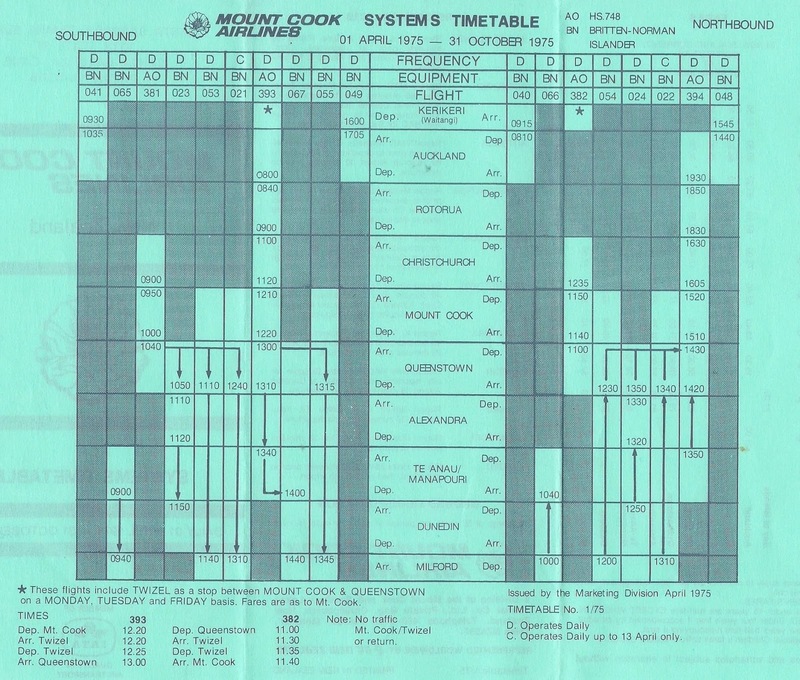 With the introduction of the summer schedule in late 1973 Mount Cook increased the Auckland frequency to a daily service. With traffic continuing to grow a third 748, ZK-MCA, was delivered in September 1973 leading to the introduction of a direct daily Christchurch to Queenstown service. A third Britten Norman Islander, ZK-MCB was added to the fleet in October of that year replacing the DHC Twin Otter ZK-CJZ. A day in the jumpseat, flying Christchurch-Mount Cook-Christchurch with my cousin who was First Officer. In September 1973 it was announced that NAC was to acquire a 15 per cent shareholding in the Mount Cook and Southern Lakes Tourist Company, parent company of Mount Cook Airlines and Mount Cook Air Services. Under the agreement NAC was issued with 260,000 Mount Cook shares. In return NAC agreed to apply to withdraw its Auckland-Rotorua-Christchurch service in favour of Mount Cook Airlines. The company’s 1974 Annual Report of the Airline Division stated that, The introduction of the third Hawker Siddeley 748 gave much greater flexibility in the utilisation of our aircraft, greatly increased capacity and allowed planning for the engineering and other services to be done on more economic lines. The net revenue of the branch increased by 32.7% over the previous year. By combining the Auckland/Rotorua/Christchurch service, taken over from NAC in October, with our Auckland/Rotorua/Mt Cook services, we have been able to move traffic from one route to the other to make the maximum use of the available seats. 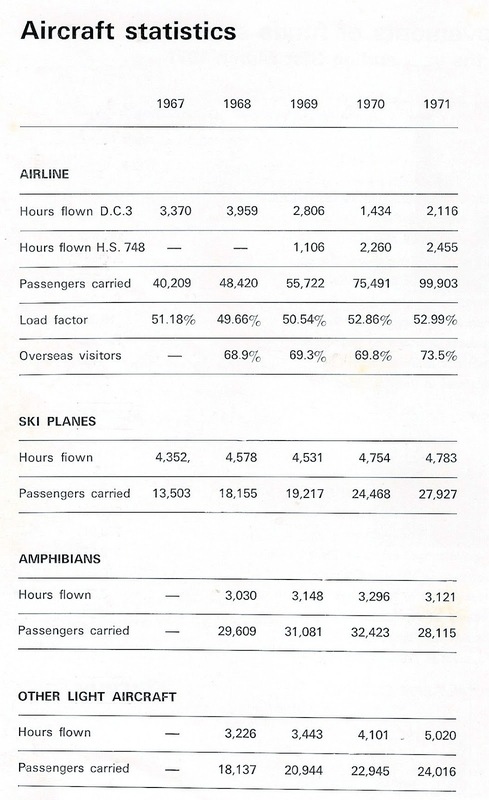 In slack months, such as May and June, the two services, which previously had low load-factors, were combined into one, with a reasonably high load factor and saved a large number of hours of flying each month. A close working relationship with NAC has allowed us to charter their Friendships during our peak periods, while they have made considerable use of our surplus capacity outside our peaks. This rationalisation was beneficial for both Airlines… At Mount Cook, the centre of the strip has been rebuilt and resealed and a large hard-standing area constructed. This is to cater for the large number of aircraft movements at this airfield which often amounts to sixteen HS748's and DC3's and one hundred Ski-planes per day. An attractive terminal building constructed to an alpine design was completed in early December. It has counters to process airline and ski-plane passengers, lounge space for waiting passengers and on the top floor, a flight control office. The 11-seater Goose amphibian is doing an excellent job in serving the Bay of Islands area, but its seat/mile costs are very much higher than those of the HS748, and its capacity is limited. It is intended to get an airstrip developed in the Bay of Islands area, enabling the HS748 aircraft to fly there through Queenstown, Mount Cook and Auckland. As early as September 1974 the company was looking at upgrading to jets. At that time Hawker-Siddeley had released plans for a four-engine jet, designated the Hawker Siddeley 146. It was proposed that the 146 would carry between 90 and 100 passengers and would be capable of using of working from the company’s existing airfields. While Mount Cook was very interested in the aircraft, plans for its development never transpired at that time. Ironically, after the collapse of Ansett New Zealand, Mount Cook inherited and operated four British Aerospace 146 jet aircraft. 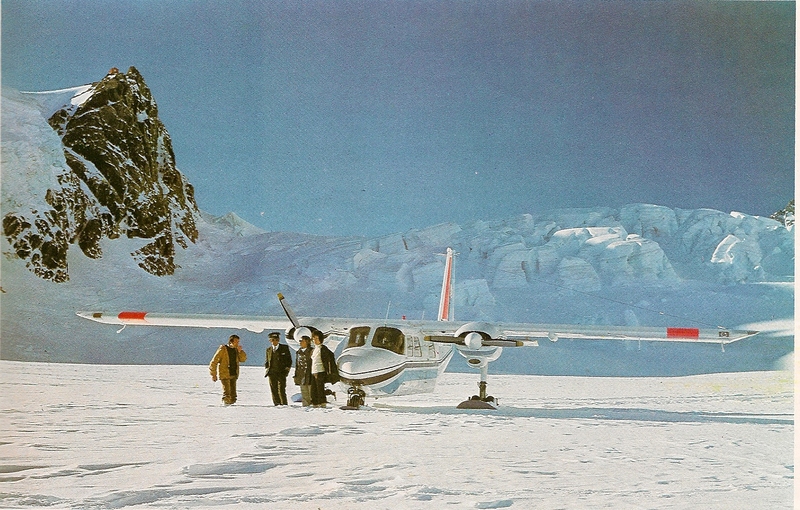 The last of Mount Cook’s de Havilland Dominies were sold in 1974. 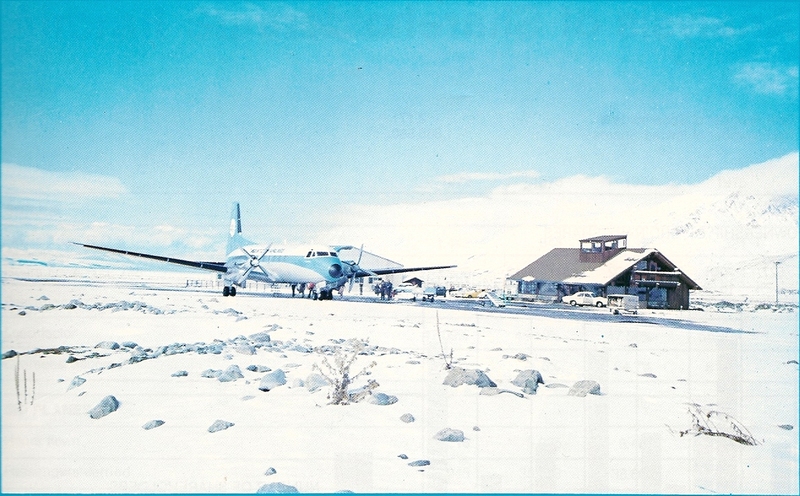 From October 1974 Twizel’s Pukaki airport, which was already used for diversions from flights into Mount Cook, received a scheduled service three times a week. On these days one of 748 flights stopped both southbound on the flights to Queenstown and northbound on the services to Mount Cook and Christchurch. At this stage the hydro developments in the MacKenzie Basin and Upper Waitaki were in full swing and Twizel had become a significant town. Above the timetable effective 1 April 1975... the Twizel schedule is at the bottom of the page. 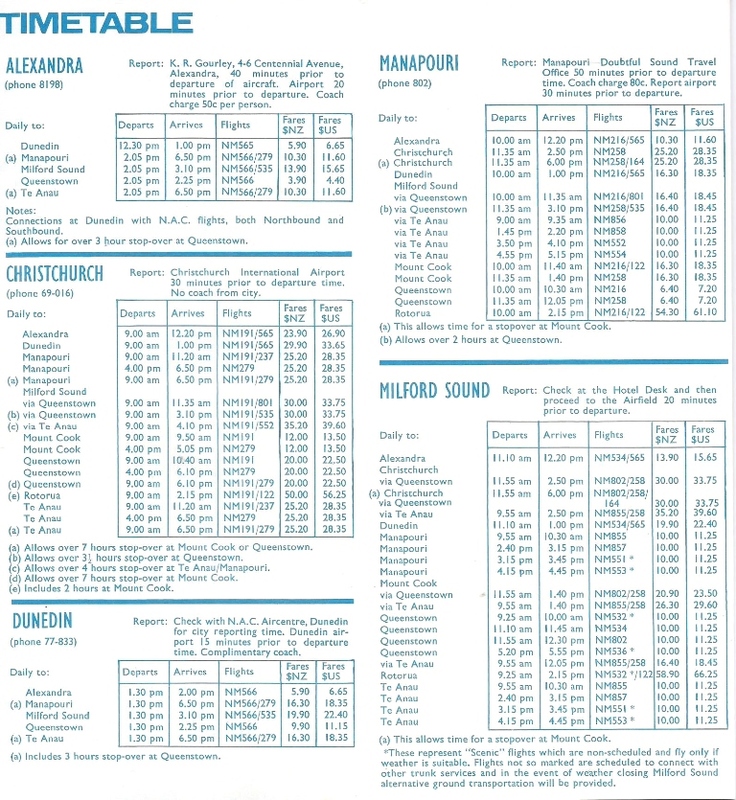 Below, from the timetable effective 1 April 1976. Remember when phone numbers were only 3 digits long in rural areas? In 1974 the Auckland based amphibian fleet was made up of three 5-passenger Grumman Widgeons and one 11 passenger Grumman Goose. Daily flights were scheduled to Great Barrier Island, twice daily to Kawau Island, four times daily to Pakatoa and Waiheke Island and three times daily to Paihia. Charter flying was also an important part of the amphibian operations and these operated to all parts of the Gulf, the Bay of Islands and as far south as Rotorua as well as servicing the Tiritiri, Mokohinau and Cuvier lighthouses and mercy flights for accident and maternity cases. Increasingly, however, the company was finding the Widgeon fleet uneconomic and more expensive to maintain. The decision was made to introduce a second Goose but the aircraft crashed at Wichita, Kansas on its delivery flight. With the loss of the second Grumman Goose Mount Cook sought approval to operate Britten Norman Island to Kerikeri. ZK-MCC duly arrived in New Zealand on the 31st of December 1974 and this was followed by ZK-MCD in January and ZK-MCE in April 1975. An Islander was quickly put to work on non-scheduled flights from Auckland to Kerikeri beginning in January 1975. From the 1st of April 1975 an Islander was also used to operate an Auckland to Great Barrier Island service in addition to the existing amphibian service which continued unchanged. 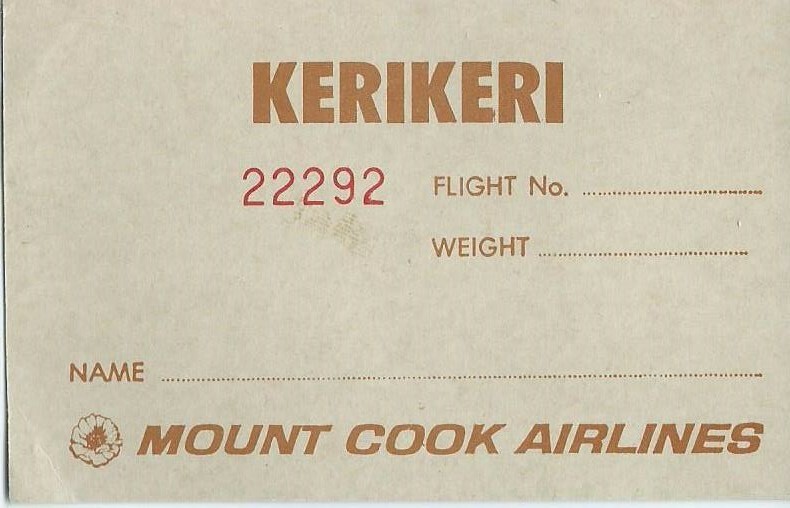 Further expansion of the Kerikeri service occurred on the 3rd of November 1975 when Mount Cook Airlines expanded its daily air link between the Kerikeri and Auckland to four Islander flights a day. At this time Mount Cook was negotiating with the Government about the possibility of upgrading the Kerikeri airfield s it could take Hawker Siddeley flights. On the 30th of April 1976 Mount Cook closed its Auckland-based amphibian operations due to substantial losses. The aircraft were expensive to maintain with $40,000 spent on each aircraft over every two years. The company also cited that fact that it was bound by the award rates and restrictive conditions of the various unions. The Auckland operation was later sold to Sea Bee Air. 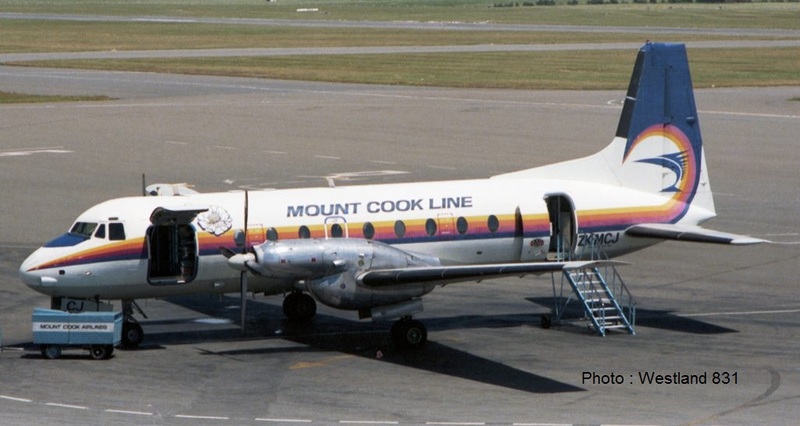 Meanwhile, the Stewart Island service continued to be operated by Mount Cook Airlines until the 3rd of September 1976 when it passed to Stewart Island Air Services. With the closure of the Auckland amphibian base at Mechanics Bay Mount Cook Airlines had only one BN Islander based at Auckland for the Kerikeri and Great Barrier Island services. At the end of October 1976 Mount Cook Airline withdrew its BN Islander service to Great Barrier Island because of a lack of local support. The November issue of NZ Wings carried an interesting article on Mount Cook and NAC’s BN Islander operations in Northland. Mount Cook Airlines operation is almost wholly directed towards the tourist, in keeping with the overall direction of the Mount Cook company. Those tourists flying the Islander from Auckland to Kerikeri in the Bay of Islands are mostly Australians and Americans… flown by the airline's local operations manager Bruce Packer a long time MCA identity in Auckland - and his off-sider Warren Dwight… The Kerikeri service operates three times a day during the summer season, and twice daily in the winter. With this schedule there is not much spare capacity on the Islander, but Bruce Packer and Warren Dwight do get called on for the occasional charter or scenic flights, and also for carrying overloads from Mount Cook's 748 services to Rotorua or similarly for Air North services from Kaikohe... MCA's Islander operates only VFR, and on the 125 mile journey between Auckland and Kerikeri it scuds along at around 1,000 ft, giving the passengers a magnificent view of some very attractive tourist-type countryside. At 128 kts indicated and 2300 rpm the trip is scheduled to take 55 minutes; the lower power setting results in less noise in the cabin, and conversation was noticeably easier than in NAC's aircraft where in fact the pilot used a public address system to converse with the passengers. Kerikeri airfield is what you would expect; virtually a grass clearing in the middle of the countryside. Passenger facilities are minimal, a fenced-off patch of gravel where the mini-bus parks. It's the epitome of simplicity. On our flight we were running about an hour and a half behind schedule due to the continued presence of a low pressure system, and it took pilot Warren Dwight only 12 minutes from touch down to take off and to unload the umpteen boxes of chirping day-old chicks, load three American tourists and their baggage, and complete the documentation on the front seat of the mini-bus. The Islander is an ideal aeroplane for the Kerikeri airfield, and it makes short work of the 2,625 ft main vector or the alternative 1,900 ft strip. But the popularity of the Kerikeri service will likely soon cause the downfall of the Islander. Mount Cook Airlines has for some time wanted to put its HS748's into the Bay of Islands, and in the face of government reluctance to do the job, it has received approval in principle to take over the airfield on lease and extend it. In October 1976 Mount Cook obtained its fourth Hawker Siddeley. ZK-MCF though changing demand over the coming years meant that there was not always enough local work for it. Over the next 8 years ZK-MCF was leased overseas for a total period of 5½ years on four separate occasions. The fourth HS748 at Christchurch in January 1979 - Remember those days, when the Rolls Royce Darts screamed, when DC-10s reigned and when you could actually see an aircraft at Christchurch International? By November 1976 Mount Cook Airlines had received government approval to lease the Kerikeri airfield for 20 years and to extend it. The work involved stripping the dense scrub, excavating 25,000 cubic metres of earth and bringing in 15,000 cubic metres of metal. The hope was that the Hawker Siddeley 748s would be flying into Kerikeri by February 1977. The new 748 route was branded as the “Sunbird service” with its own logo. The Sunbird itself was described, as a Jonathan Livingstone type seagull in a lazy, leisurely glide attitude crossing the face of a warm sun, which was described somewhat like a Kerikeri orange! The effect, it was claimed, was to be more in keeping with the warmth and leisurely, Bay of Islands way of life than drawings of marlins and makos! The Sunbird service to the Bay of Islands started on the 17th of March 1977, however, the Kerikeri airport was still not open meaning the first services were flown into Kaikohe airfield. The first flight was operated by ZK-CWJ with 26 passengers, most of whom were on their way to a conference of the New Zealand Independent Meat Exporters Association at the Waitangi Hotel. 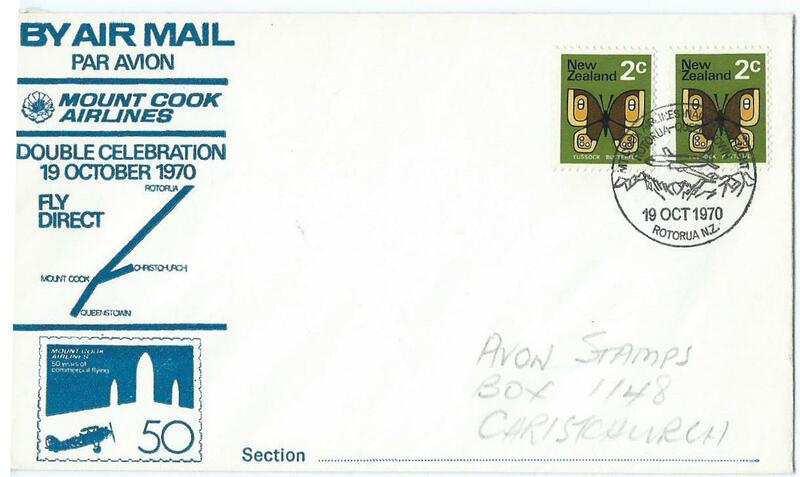 Mount Cook continued using Kaikohe until the new Kerikeri Airport was opened on the 3rd of May 1977. The first HS 748 flight to Kerikeri was flown by ZK-MCA under the command of Captain Geoff Williams and First Officer David Wyatt with Chief Purser Trevor Edlin and Steward Wally McKee looking after the cabin. This flight, however, was also not without incident. What was to have been the first Hawker Siddeley flight to touch down at the reconstructed Kerikeri Airport was held up by a mechanical fault in Auckland. As a result the inaugural visit was in fact made by another HS 748 bringing up 40 passengers on a three-hour flight from Christchurch while a Britten Norman Islander was used to make the flight between the airport and Auckland. From this point on the airline ran a limited service to Kerikeri Airport until June 1 when a full twice daily service commenced. The first Hawker Siddeley 748 Series 2A flight to Kerikeri. ZK-MCA and Britten-Norman BN2A-26 Islander, ZK-MCC, taken at Kerikeri on 3 May 1977. Pictured left to right are: David Wyatt, co-pilot on the HS748; Bruce Packer, pilot of the BN Islander; Captain Geoff Williams, operations manager and pilot of the HS748; Anna Laloli, Miss Airport 1977; Wally McKee, steward; Trevor Edlin; chief purser. Photographer unknown. While Kerikeri finally gained its HS748 air service Twizel lost its on 19th of August 1977 due to poor loadings. In the previous 12 months the airline had carried 403 people into Twizel and 925 out of the town. 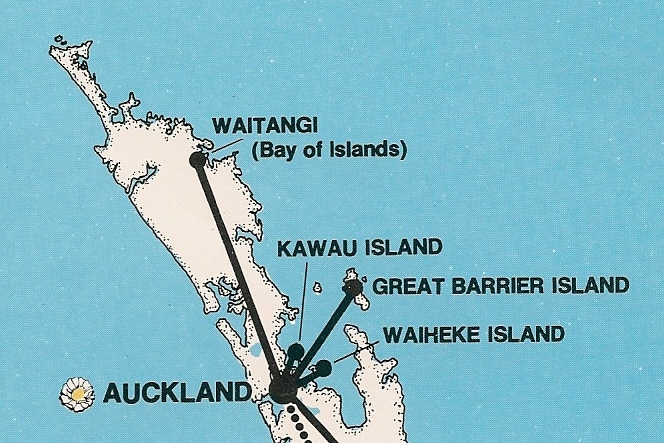 The same day Mount Cook started operating “commuter services” with morning and evening return flights between Auckland and Kerikeri and Auckland and Rotorua using the Hawker Siddeleys. 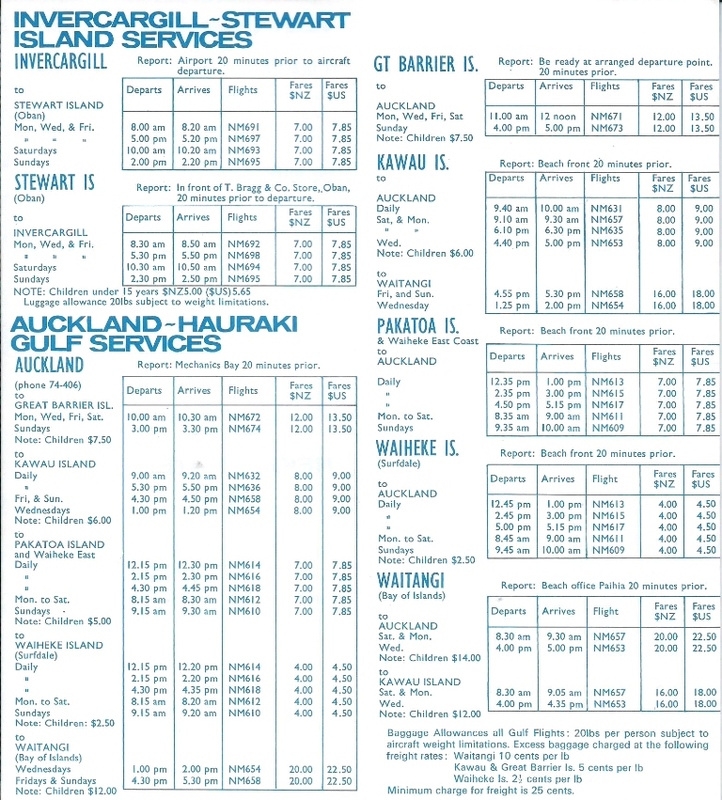 These commuter services had disappeared from the timetable by the following year but additional flights between Auckland and Rotorua appeared in the 1979 winter timetable after the collapse of Air North. By the late 1970s almost all the company’s airline services were operated by 748s. However, the company still had one Douglas DC-3 in the fleet which was mainly used in the latter years for back-up. Douglas DC-3, ZK-BEU, was retired from airline service on the 16th of May 1978. Retired Douglas DC-3 ZK-BEU sits at Christchurch waiting a buyer in September 1978. It later became a "Stagliner" for Alpine Helicopters before becoming a movie star, the Yankee Zephyr. Also in Christchurch in September 1978 was ski-equipped BN Islander ZK-MCD in a rather different scheme. The ski-trials had been done in 1974 but the Islander was re-equipped with skis for the air show commemorating the 50th Anniversary of Kingsford Smith's flight across the Tasman. Still wearing its Air Pacific colour scheme, Mount Cook's fifth Hawker Siddeley, ZK-MCJ, at Christchurch in January 1980. Notice the aircraft is branded with Mount Cook Line titles. The 1970s saw the consolidation of Mount Cook’s tourist services offering a national network. While the 1980s were to start with the promise of great things they were also to see the company challenged in a way it would never have expected. That will be the third post of this series. Muuch appreciate the time, effort and reasearch that you apply to these histories. I look forward to each Sunday morning read. 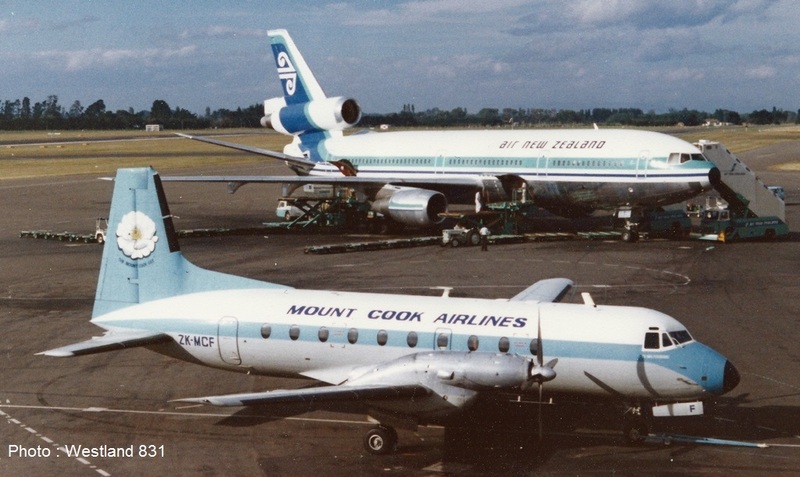 An excellent history of Mount Cook Airlines. Congratulations on a well-researched and written article. Thank you. Bruce Drum, Editor, World Airline News. Thank you to you both! 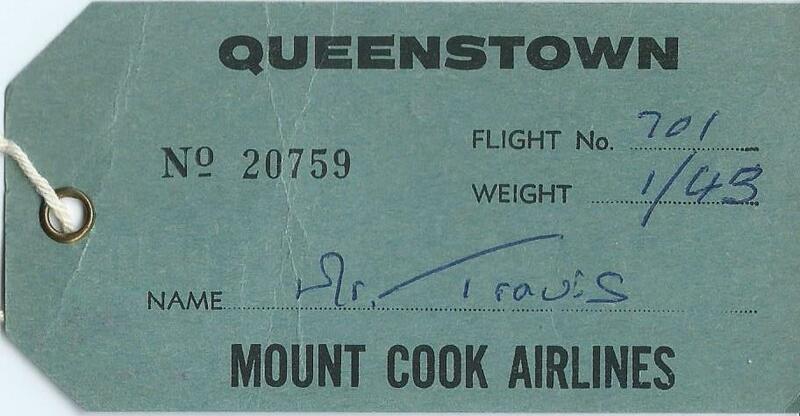 Does anyone know the total number of Islanders that were registered to Mount Cook Airlines in the 1980's? Re the Islanders, in mid 1982 did they still all sport the blue and red tail fin or did they try going with the short lived livery with dark blue and yellow cheat lines like the HS748? I presume you mean the photo of MCF in this post... If so, MCF was the only aircraft to appear in this scheme. What's Air Chathams' Convair doing in Tonga? Regional Air Services - What future?